The first time I visited Trail of Lights, I was mesmerized by the beauty of it all, especially the tunnel at the entrance. I spun around inside the Zilker Tree until I was dizzy, and fell even more in love with the Austin skyline. This holiday magic is something I want to experience every year. Visiting Trail of Lights is a yearly tradition for most Austin residents. If you’ve never been before, watch the short video below for more information on this year’s event, which will run from Dec. 9 to Dec. 23. And keep reading for this year’s pro tips! Past visitors of the trail will notice improvements to the the entry, middle, and exit tunnels this year. Tiny Town, one of the oldest displays, receives updates and upgrades every year by a Trail of Lights Foundation sponsor. And, as always, Austin flare creates a whole new experience for repeat visitors. You’ll never see exactly the same thing twice. This year in particular, the foundation is emphasizing nightly entertainment and local artists. For instance, Whiskey Shivers, along with other local performers, will be a featured headliner at the Night Lights Preview Party on Dec. 8, 2017. Other local artists and community performers will be featured throughout the month of December on two stages along the trail. Visit the event website for a full list of performers. Here’s the full list of food vendors. Parking. You must purchase a pre-paid parking pass for $15 per vehicle. Be aware there are a limited number of parking spots available at the park, so passes must be purchased in advance. Parking passes may also sell out, so plan in advance. Transportation. Shuttles are available from Burger Center in Sunset Valley (3200 Jones Road) and Republic Square Park downtown (422 Guadalupe St.). I highly encourage you to utilize them. Shuttle fare is $5 per person. If purchased in advance, the $5 includes your entry fee, as well. General Admission. Some nights are free of charge; some nights have a $3 entry fee. Check the official site for dates. ZIP Fast Pass. The ZIP allows you access to the park an hour before the general public at a designated entrance, and includes fun perks such as snacks and washrooms. Passes are $15 or $20 per person, depending on the date of purchase. Platinum Pass. This is a concierge service for the ultimate Trail of Lights experience. It includes valet parking, guides, golf cart shuttle access, access to the Platinum Lounge, a drink ticket, ride pass, snacks, and washrooms. Passes are $80 per person, $150 for two, and $260 for four. Supporter Pass. This purchase will benefit Trail of Lights Foundation. It also provides you with two ZIP Fast Passes, a limited edition ornament, early entrance, Platinum Lounge access, and snacks. This year’s Fun Run is scheduled for Dec. 2, 2017. Stick around after the run for the Finish Line Festival with local food trucks, activity tents, a costume contest, and more. Night Lights, the trail’s kick-off event, will be held Dec. 8, 2017. Enjoy local performers, appetizers from some of Austin’s tastiest restaurants, an open bar, car show, and amusement rides. The more volunteers, the better. There are multiple opportunities to help make Trail of Lights 2017 a success. Volunteers receive two ZIP Passes, dinner, and a Trail of Lights hat. Trail of Lights Foundation strives to make sure everyone in our community can attend. 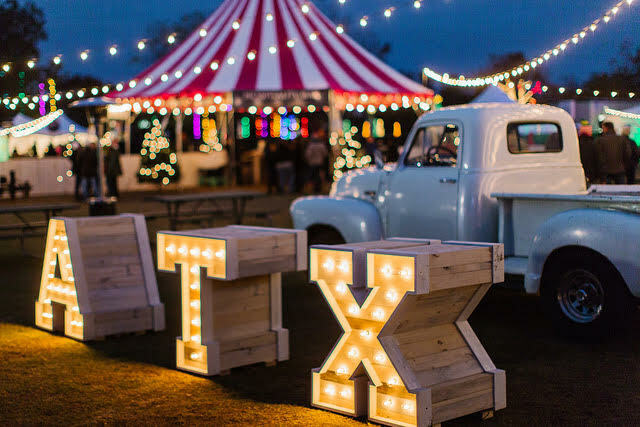 This integral event brings Austin together to enjoy a memorable holiday experience. This year should be no different. Have a great time at the 2017 Trail of Lights! For more information regarding dates, ticket prices, and events, visit austintrailoflights.org. Tickets are now on sale. The trail is open to the public Dec. 9 though Dec. 23. Are you attending Trail of Lights this year?